The Senate Special Committee on Aging is holding the first of a series of hearings Wednesday into why the prices of medicines that have been on the market for decades are suddenly climbing. The investigation by the Senate committee, led by Maine Republican Susan Collins and Missouri Democrat Claire McCaskill, is focusing on four pharmaceutical companies that bought the rights to certain drugs, and then dramatically increased the prices. Collins called the price hikes – as much as nearly 5,000 percent in one case — "egregious." "We&apos;ve had nontraditional companies come in, buy the rights to these drugs and then hike it up very high – and, as one executive put it, just because they can," Collins tells NPR. Collins and McCaskill last month requested detailed information from Turing Pharmaceuticals, Valeant Pharmaceuticals, Retrophin and Rodelis Therapeutics about several drugs whose prices have skyrocketed in the last year. In a letter to Valeant, the senators asked for information on three drugs, including Cuprimine, a medicine that treats a metabolic condition called Wilson&apos;s disease. The price of Cuprimine jumped nearly nearly 3,000 percent after Valeant bought the rights to sell it, from $888 for 100 capsules to $26,189 for 100. They&apos;ve asked Turing to explain the increase in the price of the toxoplasmosis drug Daraprim, which went from $13 a pill to $750; and they have requested information from Retrophin about why the price of Thiola, a drug to treat a rare kidney condition, rose from $1.50 a pill to $30. 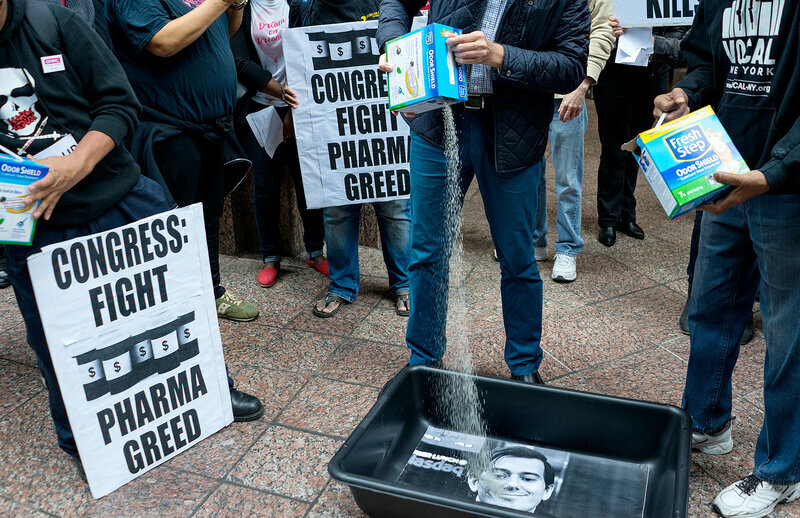 Finally the senators asked Rodelis how and why the company decided to raise the price of Seromycin, which treats multidrug-resistant tuberculosis, from just $500 for 30 pills to $10,800. "Some of these companies seem to act more like hedge funds than traditional pharmaceutical companies," Collins says. Collins and McCaskill say none of the four companies fully responded to their requests by last week&apos;s deadline. In a response to NPR&apos;s request for comment, a Valient spokeswoman emailed, "We are cooperating with the committee&apos;s review, including providing documents they requested." Retrophin supplied this written statement: "Pharmaceutical pricing that strikes the right balance between affordability and enabling innovation is an issue of legitimate concern for patients and the industry, and we look forward to sharing our views with the special committee." Turing and Rodelis didn&apos;t respond to interview requests by NPR. The senators say they are determined to get answers; both pledge to issue subpoenas if the companies don&apos;t voluntarily comply. Executives from the companies aren&apos;t scheduled to appear at Wednesday&apos;s hearing. McCaskill describes it as a "table-setting" hearing, where representatives from pharmacies, hospitals and universities will lay out the issue. The committee intends to summon executives from the companies later. Both senators say they are keen to learn how the companies chose the drugs they bought and how they settled on the high prices. "This may be a business model," McCaskill says. "It may be a way of gouging the public with drugs that are off patent but don&apos;t have a lot of competition because they&apos;re not widely prescribed." She says she became worried about huge price hikes last summer at a hearing that was supposed to be about tax policy. An executive from Valeant was at the hearing, and McCaskill learned that the company had recently purchased rights to a heart drug called Isuprel and then raised the price by more than 500 percent. "I asked some pointed questions at that hearing," McCaskill says, "and I never got answers. And I still haven&apos;t gotten the complete answers." Traditionally, drug companies defend high prices by saying they spent a lot on the research and development of the drug in question. But Valeant didn&apos;t develop Isuprel; it acquired the drug long after it was on the market. Valeant sent McCaskill a letter explaining that Isuprel is part of an in-hospital treatment and Valeant&apos;s analysis showed that hospitals could bear the cost. "Valeant&apos;s increases in the list prices of Nitropress and Isuprel have had limited impact on the average hospital&apos;s costs," the company letter said. It said some hospitals use a larger volume of the drugs and added, "For those institutions where the impact was significantly greater, we are beginning to reach out to hospitals to determine an appropriate pricing strategy." Companies like Turing are different from traditional drug companies, according toPratap Khedkar, a managing director at ZS Associates who consults with the pharmaceutical industry on pricing. He says that&apos;s because they&apos;re not focused on developing new products. "It does sound like somebody who&apos;s flipping houses or something," Khedkar says, "because you&apos;re not adding much value. You&apos;re simply looking for arbitrage, so that&apos;s much more of a hedge fund business than a pharmaceutical business."